Just returned from my post-op appointment in West Los Angeles. It was just a short check up, and essentially everything is checking out fine, the doctor said.. I was given a baggy of tiny rubber bands, made an appointment for next week and was sent on my way. For this coming week, I will be able to take off these bands to eat soft foods (think mashed potatoes), brush my teeth, and do mouth exercises (opening and closing). And then put them right back on. Now is that crazy, or is that crazy? 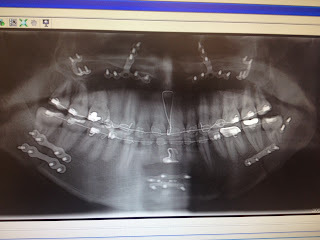 The doc (I visited Dr. Walline today -- one of the two doctors who operated on me -- while Dr. Relle is on vacay) took out my bands connecting my teeth in my mouth, and asked me to open and close my mouth several times. The movement felt ... unnatural. Like a robot. Weird how you can not use something for just one week and it seem foreign once you use it again. I don't have to take out the bands if I don't want to, apparently. I can leave them in and remain on an all liquid diet. But I think it would be nice to eat soft foods now, practice using my mouth again and, of course, brush. Carla hasn't said anything, but I'm sure my mouth doesn't smell nice. I also weighed myself today. I've lost nearly 5 pounds in one week. Not too bad in my opinion.